We can’t always pick our floors, but when we can, we pick wood: solid wood, lots of square footage, and antique, if we can get it. Unfortunately, no one ever boasts about the ease of caring for their hardwood floors. Sometimes we’re lucky enough to have wood floors that magically absorb dirt and grime. All it takes to make these beauties really shine is a good sweep and a damp mop. I am currently not so lucky and if you’re here, you’re not so lucky either! My friends, our luck is about to change and it’s coming in the form of Pro Shot Industrial Re-Newing Floor Restorer . This product is a dream come true. Application is easy. It’s incredibly affordable. The smell is unassumingly pleasant (a hint of almond). And the result is better than I could have ever expected. Why Restore Your Wood Floors? Floors take a beating. We walk, spill, and drop things on them. We drag furniture across them. We let our pets in the house and heaven knows what they do to them; scratches, accidents, slobber and excessive vacuuming because you have the only breed that sheds year round. Floors are important and we want them to be able to take everything we throw at them. There’s a reason we settle on the mediocre rental or buy that house specifically because it has wood floors. Wood floors are timeless and beautiful. They’re unique and add a depth to the room with their color, grain, and the character they build over time. Wood floors are friendly. They’re soft on the feet, easy on the joints, quiet when walked on, and unlike tile or stone, dishes and breakables have a better chance of surviving a fall onto a wood floor. Even with the most attentive caregivers, over time, wood floors lose their luster and accumulate unavoidable scratches and dings. Restoring your wood floors will bring a whole new brilliance to your home, will protect them from the wear and tear of daily foot traffic, and will make it easier to keep them clean. There are hundreds of wood floor restorers. It can be overwhelming deciding which product to use especially when we’re not limited to the selection in the local cleaning aisle. Being able to do research and shop online is both a blessing and a curse. A blessing to know that hundreds of other people will be able to tell me how it works. A curse because half their reviews give me hope while the other half makes me want to lock myself away and hide from my floors forever! Luckily I’ve done some of the research for you. There are five major factors to consider in deciding which Floor Restoratives you should use. How damaged are your floors? What finish, if any, do you have on your floors? How user friendly do you need the product to be (i.e. basic home use or professional)? How much time do you have to spend on restoring your floors? In the end, the real question is how much time, money, and effort are you willing to put into restoring your wood floors? Again, if you’re here, you probably feel the same way I do! I want it to be inexpensive and simple to use all the while being a quality product that makes my floors shine like new! This is the choice if you want that wow factor added back to your floors. While most products do well to improve the appearance of your warn floors the ProShot takes them all the way back to like new. If you don’t believe me head over to Amazon and check out some of the reviewers before and after pics! Now, these results do come with some drawbacks. The product, while easy to apply, can be harmful if you’re not careful while working with it (much like the original polyurethane coating that was applied to your floor at its birth). You’ll want to wear PPE (that’s personal protective equipment) such as gloves and safety glasses when applying it. I would also open the windows to provide ample ventilation. Fortunately, once dry, ProShot is perfectly safe. It provides profession results for a fraction of the cost of sanding and resealing your floors. It even adds a degree of slip resistance once dry. If you truly want to restore your floor without resorting to paying a pro you’re best bet is to go ahead and pick this up from Amazon. I am loving this product. I grew up using Scott’s Liquid Gold Aerosol Wood Cleaner on furniture and cabinets. There is nothing better than the mellow almond smell it leaves in the house. I was overjoyed to find they make a hardwood floor restorer! The application is practically as easy as your Swiffer. Squirt it on the floor, one section at a time, and evenly apply with a fresh sponge mop. It only takes one hour to dry for light foot traffic and eight hours until you can replace any furniture. This short dry time cannot be rivaled! It enhances the natural colors of your wood floors (don’t worry, no dyes, just enhancements!) and helps in hiding small scratches, dents, and damage to the floor. The only real drawback is this a temporary topical product. You’ll need to reapply this finish every 3-4 months since it will fade away with time. With the ease of application, it’s just another step in cleaning your wood floors. It’s also a great option for sprucing up wood floors in a rental on the cheap to ensure you get that deposit back. If you’re looking for an easy, affordable, wood restorer that will give your hardwood floors a new life, Scott’s Liquid Gold Floor Restore is the product for you. With this product you may only need to apply it once or twice a year depending on the traffic of your floors. This product will provide a solid and clear finish that will only need one application. It is recommended to be used only on slightly dull and worn floors but is a quality alternative for someone who wishes to maintain floors already in fairly decent condition with fewer applications throughout the year. Bona Refresher is an actual polyurethane application. It’s not just rejuvenating the existing finish. It’s adding a new layer of finish. It’s recommended to use on dull, worn-out, scratched, and tired-looking hardwood floors. The reviewers rave about this product… that is, when they’re not complaining about the difficulty of application. The instructions for application are fairly simple. You’re to slightly dampen the applicator pad with water, attach it to the mop, squirt the refresher onto the floor and then, working in small areas, spread evenly. Unfortunately it seems it is easier said than done. When the users can get it applied correctly, the result is beautiful! It truly does revitalize the appearance of floors that were once dull, scratched, and lifeless. 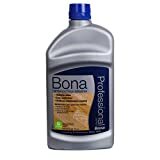 This Bona product is also fairly affordable being only slightly more expensive than Scott’s Liquid Gold. If you consider yourself more of a “PROsumer” than a diy consumer and you are looking for more of a permanent solution this may be your ticket. After extensive research I’ve determined that, yes, we will always choose the house with hardwood floors and that after we do we will stand there scratching our heads in wonderment on how to clean our floors. In fact, we’ll do this so long that it will not only be time to clean our floors but restore them back their original brilliance. When that time comes it will be Pro Shot Industrial Re-Newing Floor Restorer that comes the rescue. With it’s easy application, quick dry times, and gleaming results, you simply can’t beat it! Our hardwood floors take care of us by gently cradling dropped dishes, keeping our feet happy, and making our home more beautiful. It’s only fair that we return the favor by restoring and maintaining their beauty and functionality now and for years to come. The product Rejuvenate is horrible! I can’t get the cloudy/shiny mixture off no matter what the manufacturer recommends..